The maintenance devices work very carefully sending out the low portions of electricity and causing no immediate damage to the battery. Such units are represented by trickle chargers and battery tenders. 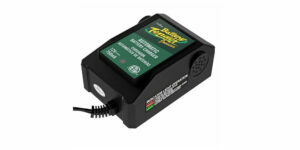 The motorcycle trickle charger feeds constant low current keeping the bank’s level high. It is considered safe, while once the charge is full, the device must be removed in order to prevent overfeeding issues. The motorcycle battery tender does much the same thing but stops feeding automatically upon reaching the top level. It resumes feeding process as soon as there’s some reduction of the battery volume. 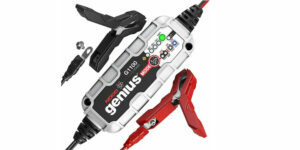 It is very handy — and more expensive than a regular trickle charger for motorcycles. The compact smart feeding device from CTEK has several stages of fully automated powering. It implies different feeding technologies, switching to the efficient pulse charging aimed to keep the power bank of a bike ready-to-go. The precise microprocessor analyzes the battery during the feeding process, turning on the necessary mode without user’s interfering. There’s no need to discover if the poles and banks have got sulfates on them — the slow charging will cause the CTEK rush a high-current impulse to break the chemical deposits. Its ability to perform the charging even at extremely cold temperature adds to its score as the best motorcycle battery tender. However, its 12V operational voltage makes it useless for older or rare models of bikes (featuring the 6V battery). The unit has various levels of protection and won’t allow the motorcycle battery to catch flame or to get damage through the inadequate connection. It also secures the power bank and the charger itself from the short circuit surge granting its position among the safest battery chargers for motorcycles. Special mode for a motorcycle battery treatment. The charger lets the user shift between the operational phases manually. Thin wires design enables the connection even through the shut trunk. Poor quality of the plastic clamps coverage might cause injury if got broken during usage. This unit represents 4 battery chargers for motorcycles under one cover as it provides 4 independent outputs feeding solid 1.25 Amps at once. It can handle the batteries of different types provided that their voltage amounts to 12V. However, this is valid for smaller batteries like ones of scooters, motorcycles, lawnmowers, etc. 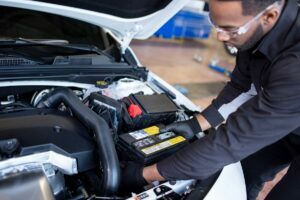 Possible though, getting the car battery full would require considerable time. 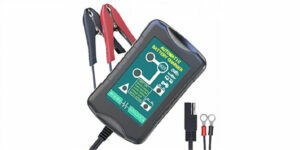 The good news is that this multi-charger is temperature-proof, so installing it as a maintaining device for several vehicles or other equipment in the garage is a great winter-idling solution. The microprocessor handles the banks independently switching them to the waiting mode or the storage one once the power bank is full. Due to constant monitoring, it automatically resumes the current feeding once the voltage falls below the appropriate level. The powering station has basic protection for preventing the overload of the power bank, securing the correct clamps’ connection (as it signals about the dangerous reverse polarity issue), ensuring the spark depression. Wide ventilation slots prevent the system from overheating. Comprehensive light indicator for each charging element that shows the performed operation and the status of the battery. Each station is equipped with the alligator clips and O-rings sets. No specific desulfation option (though partially performed by the full current surge upon the initial charging stage). Compact design and lightweight coating of this 12V smart charging system could nominee this device for the best battery maintainer for a motorcycle. However, the physical size reflects the capacity as well. The unit is able to feed 0.75 Amps only, which is not enough to maintain the large battery like SUV’ one. However, it won’t make any trouble even in the tiny garage space, while 12-feet powering cord provides for various location schemes. The light indicators are quite communicative reflecting the main stages of the feeding process. The unit is not powerful enough and not fit for breaking the sulfate deposits in the worn out batteries, yet, it is able to revive the ones that are close to the empty state. The charging includes a full schedule of the battery tender changing to the “keeper” mode once the charging level gets to the top. This powering device can also be listed among the safest battery chargers for motorcycles. It features the non-sparking technology, incorrect polarity shutdown, smart feeding within the battery capacity. Automatically turns off with the engine ignition, not harming the motorcycle system. Built-in safety timer secures the feeding process from the electricity cuts. Solid built of the alligator clamps and ring connection clips. No on-cover controls for turning the charger on or off. That’s a single solution for all the household vehicles and equipment. It can switch between the 6V and 12V current grounding on the data it collects from the battery itself, without user’s intervention. Two feeding modes (quick and slow) available testify for its position as the best motorcycle battery tender. Still, the low charge level and considerable sulfate deposits might cause errors in the tender’s detection. Still, its set of options is quite wide. 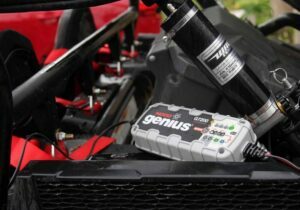 The quick powering scheme implies replenishing of the power bank with 4 Amps feed (ideal for cars and alike big batteries) and the slower one feeds 1 Amp at a time (a special “motorcycle” mode). The unit is designed to perform the 8-steps process of intelligent power feeding including the “recondition” and “full” stages. The careful treating of the battery enables the usage of this smart motorcycle battery tender with various types of power banks. It can handle any of the AGM or SLA battery, and will efficiently feed the newer 12V Lithium-Ion models. Temperature-stable, it can work at the extreme heat and frost. Informative LCD display reflects accurate battery information and the status of the current feeding. It features controls for choosing the working mode and the type of the battery. Non-standard polarity scheme might lead to inconvenience when hooking the charger up. Small size and light weight are combined with the solid 12V constant current performance of this power feeder. 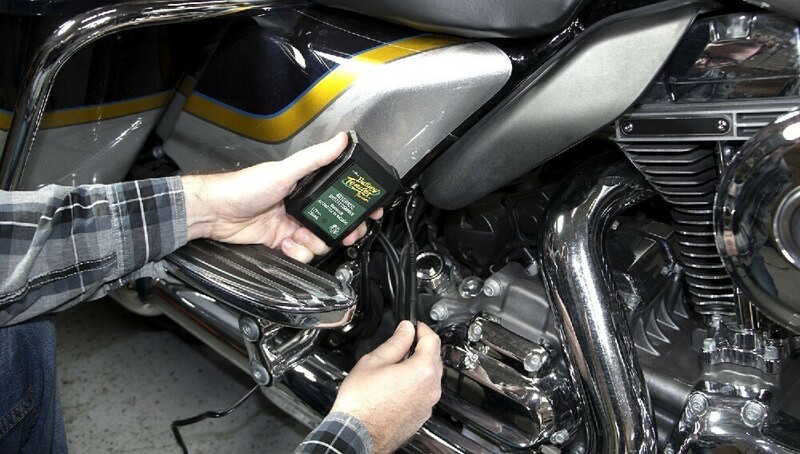 While advertised as a trickle charger for motorcycles, it features a system of sensors allowing it to adjust its performance to the state of the power bank. The unit is safe to leave hooked up as it turns to the float mode once the amps are packed to the limit of the battery. It fits well the most popular batteries types used in motorcycles: gel, lead-acid, AGM power banks. The device puts up with both service-subject and maintenance free batteries, always correcting its voltage to avoid the excessive load on the power bank. It will also slow down once the battery is near 90% of its level in order to apply the absorption mode and then keep the battery level without charging too many amps to it. The charger signalizes once there is an error in the hook-up scheme and does not allow the current feeding to start until the issue is solved. Three-colors LED indicator for signaling about the state of the powering and the level of the power bank. Well-fitting fast-grip connection that’s easy to hook up and unplug. 8-feet power output cable ensures the direct outlet connection (without mediators). The alligator clamps are not fully insulated and to be treated with caution. 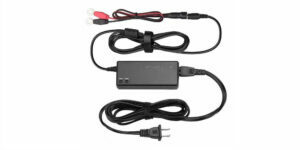 This charging unit has 1.1 Amps feeding power and changeable voltage between 6V and 12V. It can charge small batteries efficiently within 48 hours and grant their safety by automatically shifting to the maintaining operation. The smart current feeder will keep the motorcycle ready for a drive, upon that charging fast the Lithium Ion bank of the smartphone. This option is available at 12V charging only, while lead-acid batteries can be powered with 6V and 12V voltage depending on their specs. Considering the weather-proof design and ability to charge even at low temperature, this device might well be awarded the “best 12V battery charger” prize but for the limited range of functions in the cold environment. For instance, there is no “cold mode” indicator for 6V batteries present. The trickle charger has standard protection features. It won’t set the lead-acid power bank on fire due to the spark-elimination connection. The unit will not feed or trickle once there is a wrong clamps’ application, flashing the alert light to warn the user. Smart and precise diagnostics of the power bank. Compact and lightweight – easy to use in any motorcycle environment. The clamps are fully covered with plastic and feature built-in eyelets. Short power cord limits the space of use. This small unit looking like a wall charger for a smartphone represents a “tank armor” for the powered battery. It has multiple features for keeping the battery powered just within the limits it is intended. There is a voltage and current limitation to the trickle charger performance, as well as short circuit prevention option. It doesn’t allow a battery to get empty by applying a specific anti-discharge scheme and signaling if there are any problems with the connection of leads to the power bank. The unit has enhanced heat-emitting system not letting it overheat and go on fire. Its unresponsiveness to exposure factors, such as dust and rain, grants its safe use outdoors, within not too low temperatures. This trickle powerup also secures the power bank from excessive amps, featuring the smart function of charge level detection and application of the floating mode. The feeding device can power up the batteries of any type except the Li-Ion ones, at the modes of 6V and 12V power. The relevant mode is chosen through the button on the device’ casing. Powerful enough to charge small power banks. Main stages of the feeding process are indicated by LED lights. Direct electricity plug built-in the charger body ensures fast outlet connection. Insufficient length of the connection cable — not flexible for large spaces. The main function of this sturdy representative of the motorcycle battery chargers is keeping the power bank ready-to-use. It has got a microprocessor able to estimate the state of the battery and apply the current of 12V or 6V sending about 1 amp to the power bank. While this might be enough for a motorcycle, the larger batteries used in cars and boats might not show a satisfactory result. The trickle charger handles well the lead-acid power banks of the different type with the overall stuff level above 50%. Due to the intelligent diagnostics of the microprocessor, it can replenish such batteries fast enough and switch to the low current mode, maintaining the voltage at the average level. The unit safeguards the battery not allowing it to receive too many amps (which results in the lower capacity of the power bank), to accumulate too much heat (and, eventually, to inflame), to get damaged by the short circuit assault. Having the clamps hooked up on the wrong side will result in the malfunction of the device because of the incorrect polarity application. 12-feet cable feels solid and thick for the proper connection. Light blinking for indication of the charging level and particulars. Handy quick-connect harness enables fast hook-up and removal of the charger. Small, only partly insulated clamps. Amps and voltage. The regular battery charger works out the current and feeds it to the battery at the high rate (4 amps plus) and voltage. The trickle charger emits small amps at low voltage. Time of power charge. The regular feeding appliance enables faster charging than a trickle charger does. Battery handling. The ordinary appliance fills even the flat battery and starts the engine almost immediately. The trickle charger won’t do the engine trick and applies to half full power banks only. Battery safety. The regular charger must be supervised and disconnected timely to avoid the decreasing and overfeeding of the bank’s capacity. The trickle charger needs less attention, though it isn’t advisable to leave it connected for a long period (unless it is a smart charger). Define the type. The motorcycle power banks are usually lead-acid (including gel-cell banks and AGM ones), some of the recent models are Li-Ion ones. Many smart feeding appliances can power both types. Read the amps and volts. The voltage maintained by the chosen charger must correspond to the one the battery has . This will ensure its optimal performance and slow discharging. As to the amps, to feed the widespread 4Ah power banks for motorcycle, almost any charger from 0.75 Amps will do. Pick the operation. 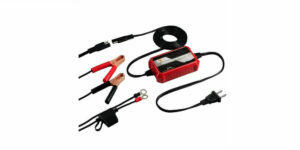 To crank up your motorcycle without much waiting, get a jump starter feeding large amps at high voltage. To restore the power bank upon a long idling, take a regular battery charger. It sends the amps at less rate causing less risk of overheat and damage. 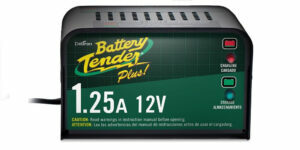 To maintain the motorcycle battery condition working so that you could use it anytime, pick the smart battery tender. It will prevent the decreasing of the battery level and keep it fully operational. Watch the amps. While in some cases using powerful high-amps appliances turns out extremely helpful, it might worsen the battery productivity and span life. For safe feeding, choose the rate equal to one-tenth of the power bank capacity. That is, if your motorcycle bank has 10 amps, charge it at 1 amp per hour and be confident there is no overheat. Watch the temperature. While most of the modern chargers can easily operate at low temperatures, not all power banks can do the same without losing their potential. If possible, get your motorcycle battery at the normal room temperature, then start the feeding. Give special care to the dead bank. If your motorcycle battery gets flat, do not use the regular high amps to refill it. Feed the half of the usual rate first, until the battery is at least half full. The smart charger will do the trick itself, grounding on its sensor readings.